Nikte 5 presents an opportunity to enjoy premium amenities throughout a brand-new, contemporary beachfront 3rd floor 2 BR condo on Half Moon Bay in Akumal. Take the elevator to beautiful granite countertops, marble flooring, and travertine showers, decorated with gorgeous native parota wood furniture and tasteful accessories, and enjoy sunrises over Half Moon Bay and sunsets over the jungle from expansive balconies. 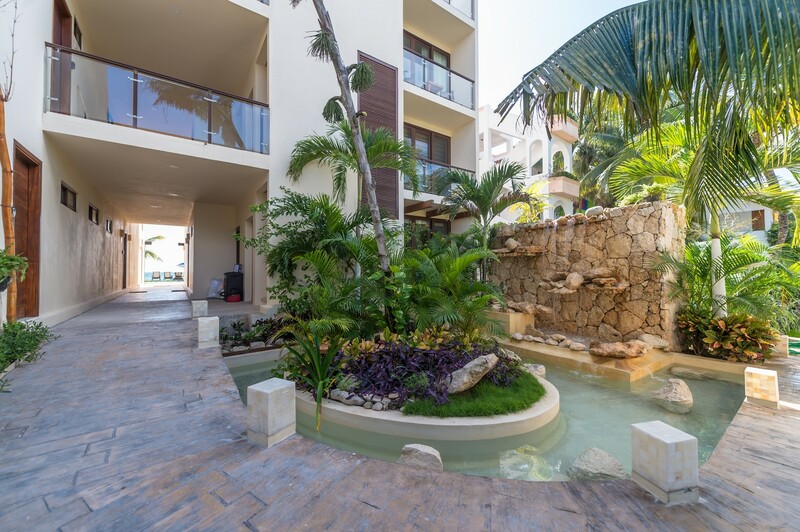 Offered for the first time, this luxury unit is in the central part of Akumal’s Half Moon Bay, within an easy walk of many local amenities, including fine restaurants, a spa, and the natural aquarium that is Yalku Lagoon. The condo boasts a large, open living/dining/kitchen area floor plan and all the modern conveniences, such as A/C, flat screen TV, and Wi-Fi. Fabulous condo, brand new, close to everything! We have stayed in Akumal many times, and this condo was one of the very best! It has 2 BR, both with King beds, that were well separated so plenty of privacy! The condo is super quiet, no noise can be heard from anywhere! The only thing we ever heard was the ocean! The views were amazing. Having been to Akumal many times, I was surprised by how much I like the location. Step out the door to amazing snorkeling at Half Moon Bay, a short walk to La Buena Vida, a grocery store steps away, close to Yal Ku. It was really a perfect location. The grounds were immaculate, pool was always clean and sparkling. They were able to rig up a way to charge our golf cart, which is always super fun to have. The condo itself was gorgeous, granite counter tops, stainless steel appliances, everything was new and worked perfectly. We enjoyed watching our favorite shows on Netflix on the brand new internet TV. I hope to return to this lovely rental home soon!